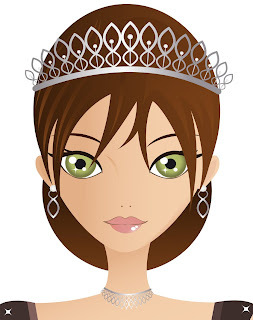 I'm a Honorary Queen on the Royal Blog Tour! It's launching April 30 through May 3. I'm so excited I've been chosen for this honor! I hope you'll become a Royal Tourist and ride along in a Royal Coach. Please come and visit my castle during the tour! For more information, please check out these links! Becky - YOU are gorgeous. I didn't know you had green eyes. I don't lnow anyone with green eyes - you are my first!!! Your crown is NOT bug enough - need a bigger one!!! Giggle........giggle...........giglle! And, of course, CONGRATULATIONS! I will definitely be riding along in "coach"........behind ya! Becky Congratulations you deserve it!!!! I love your eyes too they are so green and BIG!!! I cannot wait to see what you have in store for us! Hi, Becky! I'm so glad you're in the Tour as an honorary queen!! Apparently, the group put me on a waiting list.. well actually I'm the only one on the waiting list..lol. It was just soo funny how they qualified 60 princess and left out one.. ME... and put me on the side on a list...oops it's not a list.. it's just me on the side. I just felt outcasted after numerous unanswered questions... then finally got an answer at the end that put me on a list (the dungeons).. lol...that's sad. Oh BTW, I forgot to mention. They're now thinking of a photo for me. Because one of the questions I asked was "should I let them know about the tour if I'm on a waiting list?". Here are their exact words, "I am sorry that no one has gotten back to you about posting for the tour. I posted a message to Lucia, head of the RBT Tour, and she said yes you can mention you are a princess in waiting. You are the only one on the waiting list, so they were trying to think up a photo for you to use." (like insult to injury)...lol.